Monday was Colin's first day of preschool this year. An old pro after last year, he bounded into the room and went straight over to the play kitchen, where he announced to the instructor's assistant that the kitchen "needs a cutting board." Last week we took the boys to Toys R Us, and while playing at the train table that of course is not even as good as the one we have at home, but yet seems much more exciting to Colin, I noticed these Early Engineer trains. So now I know what Graham will be getting for his birthday. 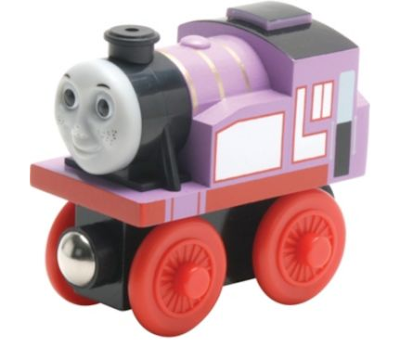 Pictured here is Rosie, who is one of my favorites because A) She is female, and B) She has such a mad crush on Thomas, which mostly seems to go unrequited. But back to Graham. I'm struggling a little because Colin's obsession with Thomas has bled over to both of his parents, and we all LOVE Thomas. But what if Graham wants to like something else? Is a love of Thomas predestined? What if Graham decides to like something really lame, like Dora the Explorer, or super annoying, like The Wiggles? CR_KCPortrait-424, originally uploaded by ilovefab4. My boy is big. I just weighed him, and he's 23 pounds. He's actually taller than he is chunky. He's a baby; I think his little fat dimples are adorable. But tonight at Graeter's, I heard a dad point him out to his kids and call him a "hoss." I don't know; I'm OK with someone he knows calling him a name that's meant to be a dimunitive. But a stranger calling him "hoss?" I'm not sure. That's alright; by next year he will beat the CRAP out of anyone who calls him a name. DSC_0026, originally uploaded by ilovefab4. We just celebrated our sixth anniversary. 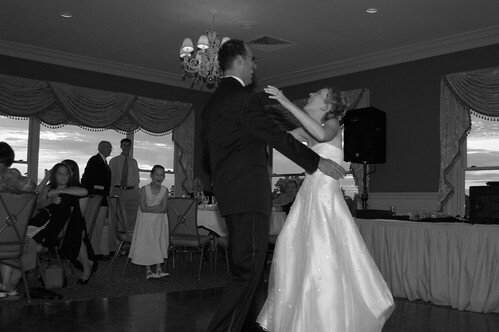 Normally, you might watch your wedding video on that day, but not us. Why not? Because we watch the wedding video EVERY. SINGLE. DAY. That's right. Colin is obsessed with the wedding video. From the brides' preparations to the guests arriving to the dancing, and everything in between, he's seen it all, probably hundreds of times. He likes to recognize people, laugh at Boppy's jokes during the welcome, or Uncle Bill's jokes during the toast. He also loves to watch Mommy dance to Brick House (I won't say having your preschooler watch you dance over and over is not a tad bit creepy), and he also, apparently, has every song from the reception memorized, which we realized tonight when he heard "Let's Hear it for the Boy" and immediately recognized it as "from the wedding video!" IMG_3914.JPG, originally uploaded by ilovefab4. 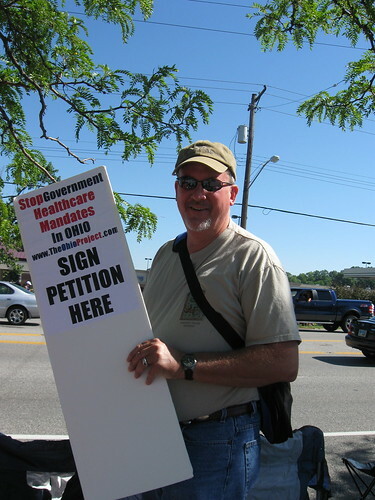 What is more patriotic than signing a petition on Independence Day? IMG_3007.JPG, originally uploaded by ilovefab4. 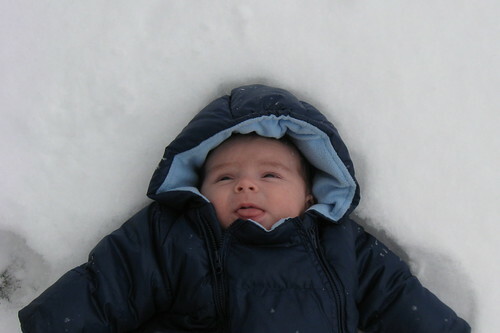 In my umpteenth attempt to start blogging again, here is a pic of Graham's first snow angel! It snowed 4 inches or snow in Cincinnati today. Graham seemed to like the snow, but only for a few minutes. By the time I got out the Flip video, Graham was crying so loudly it drowned out the audio of Colin playing.